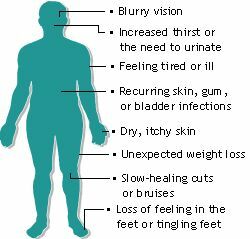 Diabetes is a group of metabolic diseases that affect how the body processes blood sugar (glucose). Sugar from food is digested and broken down into glucose (simple sugar). In a healthy person, the pancreas produces insulin that lowers blood glucose levels. The glucose is spread throughout the body and enters cells to be used as fuel (energy). The hormone insulin helps move the glucose into the cells.In a diabetic, two things may occur. One, the pancreas does not produce or produces limited amounts of insulin. Two, the pancreas in a diabetic may not properly use the insulin produced. There are two types of diabetes: Type 1, insulin dependent, is juvenile onset while Type 2, non-insulin dependent, is adult onset/insulin resistant. Both types result in high levels of glucose in the body. At age 12, singer Nick Jonas was diagnosed with diabetes, Type 1. He was on tour with his brothers (Jonas Brothers Band) when he began experiencing symptoms that included losing weight, being thirsty, and frequent trips to the bathroom. Another symptom really got to him – his attitude, usually upbeat, was very negative. By the time he went to the doctor, his blood glucose number was over 700mg/dl, requiring hospitalization to stabilize his numbers. To make a comparison, normal glucose levels range from 70-99mg/dl before meals, under 100mg/dl for fasting levels, or less than 140mg/dl two hours after eating. The New Jersey native is able to control his diabetes with insulin rather than diet. Comedian Sherri Shepherd was diagnosed with Type 2 diabetes. A former The View co-host, she experienced numbness in her feet, blurred vision, and a lack of energy. For a period of time, her doctor had her on different medications. Shepherd has since changed her eating and exercise habits as part of a healthy lifestyle. Actress Delta Burke has a family history of diabetes. Burke believes gaining weight, while she was on the television show Designing Women, lead to her diagnosis. A positive mindset, along with changes in diet and exercise, has helped her keep the disease in check. Journalist Larry King had bypass surgery after suffering a heart attack. As a result, he stopped smoking and took care of his health. Just a few years later he was diagnosed with diabetes. The TV personality was on air when a guest noticed he looked pale and he admitted he felt faint. Now the self-described Type A maintains his busy schedule while keeping the disease under control. Academy Award-winning actress Salma Hayek developed diabetes while pregnant with her daughter. The condition is referred to as gestational diabetes and increases the odds of the person developing Type 2 diabetes. Bouts of nausea lead her doctor to test her for the condition. She later found out that eating fruit high in sugar early in pregnancy may have lead to this diagnosis. Multiple awards (Oscar, Emmy, Golden Globe) winning actor Tom Hanks dealt with high blood sugar numbers for years before being diagnosed with diabetes four years ago. Singer/producer Randy Jackson found out he had diabetes during a trip to the emergency room. What the former American Idol judge thought was a bad case of the flu ended up with his blood sugar number registering 500mg/dl. He is now able to control his diabetes after gastric bypass surgery. Actress Halle Berry was recording a television series when she lapsed into a diabetic coma. After the diagnosis as a young adult, she changed her diet to improve her overall health. Comedian Drew Carey claims to have reversed the effects of diabetes through diet and lifestyle changes. After losing 80 pounds by cutting out most carbohydrates, he no longer needs diabetes medication. Chef Paula Deen’s recipes made for rather unhealthy meals, deep-fried and high in fat. She didn’t disclose her Type 2 diagnosis at first. Once the celebrity, whose dishes had been saturated in butter and bacon, came to terms with the disease, she finally began to make lighter, healthier versions.